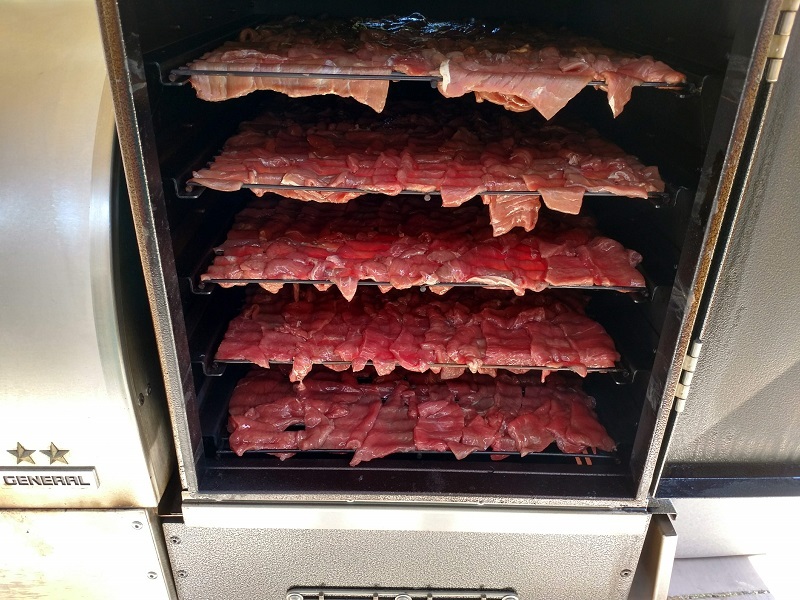 Smoked Top Sirloin Beef Jerky - The perfect combination for Hickory Smoked Top Sirloin Beef Jerky is a MAK 2 Star with the Super Smoker Box accessory and a Cabela's 80-Liter Commercial Food Dehydrator. My local butcher, Fagundes Meats, sliced up 10 lbs of 1/4 inch thick Top Sirloin Beef against the grain and marinated it with Teriyaki. I allowed the beef to marinate inside the refrigerator for 2 days to ensure that the Teriyaki had plenty of time to penetrate the meat and work it's magic. Preheated the MAK 2 Star to Smoke (180ºF) and placed the racks of marinated Top Sirloin Beef in the Super Smoker Box. Used a pair of scissors to cut the sliced beef to manageable sizes and fully loaded the trays. 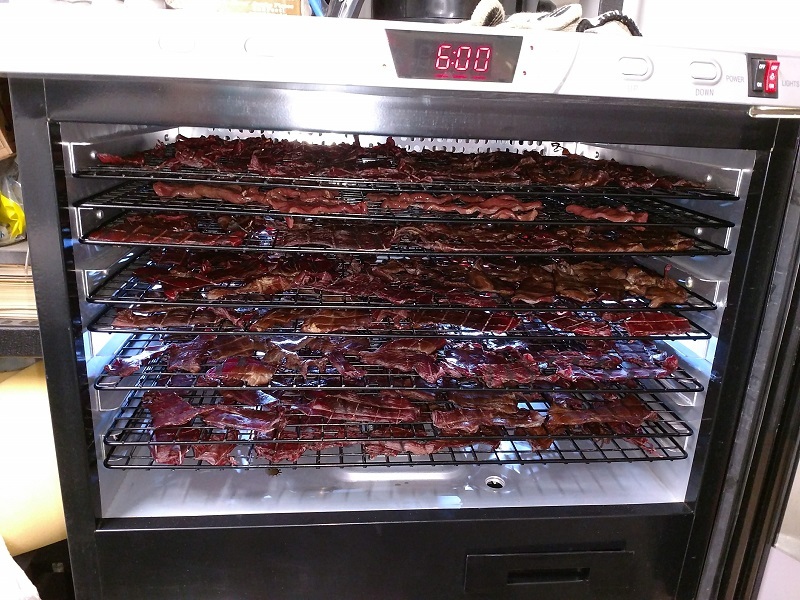 Hickory smoked the jerky for 2 hours before removing the meat and transferring it to the dehydrator trays. Preheated the Cabela's 80-Liter Commercial Food Dehydrator to 140ºF. 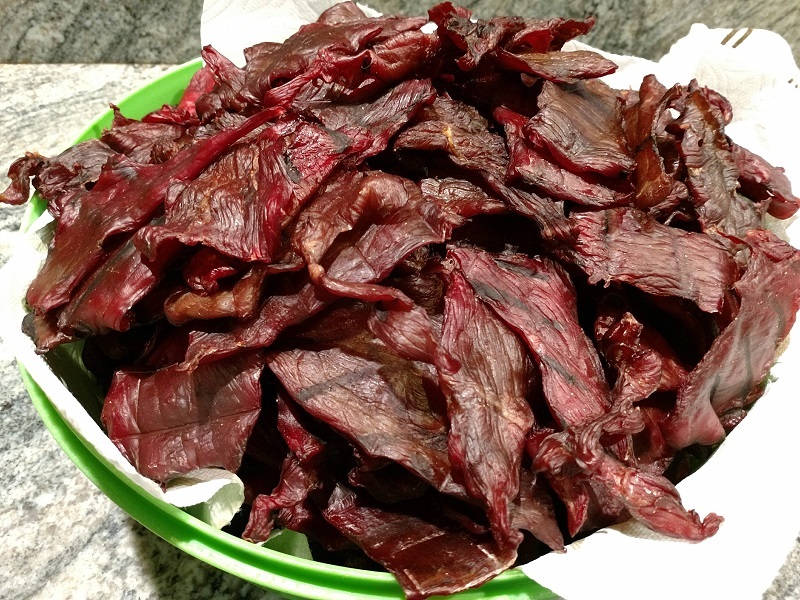 Dehydrated the jerky for an hour before increasing the temperature to 150ºF. Pull the Hickory Smoked Top sirloin Beef Jerky from the dehydrator when the jerky is dry. If the jerky breaks or cracks when it's bent then it overdone. Rest the jerky in a brown paper bag in the fridge overnight before vacuum sealing.